NEW YORK – The World Jewish Congress and Israel’s Permanent Mission to the United Nations on Tuesday marked the 70th anniversary of the November 29, 1947 UN vote that called for the establishment of a Jewish state, with a reenactment of events in the very structure that served as the UN headquarters at that time. 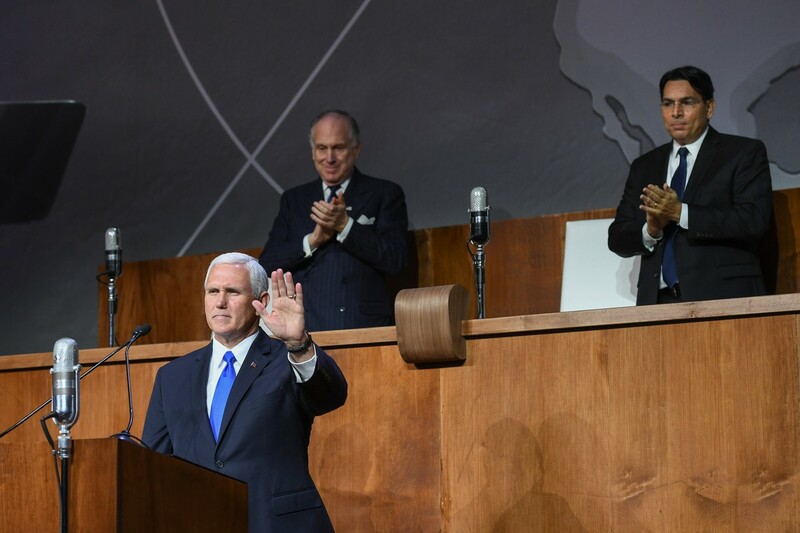 US Vice President Mike Pence spoke as guest of honor, alongside World Jewish Congress President Ronald S. Lauder and Israeli Ambassador to the UN Danny Danon. World Jewish Congress President Ronald S. Lauder emphasized in his address to the celebration at today’s Queens Museum the need for the United Nations to treat Israel as equally as any other state, and stressed his optimistic resolve for the viability of a two-state solution between Israel and the Palestinians. “Israel has never denied the right of the Palestinian Arabs to their sovereignty. Yet here we are today, still dreaming that two people – Jews and Arabs – will live together in peace. 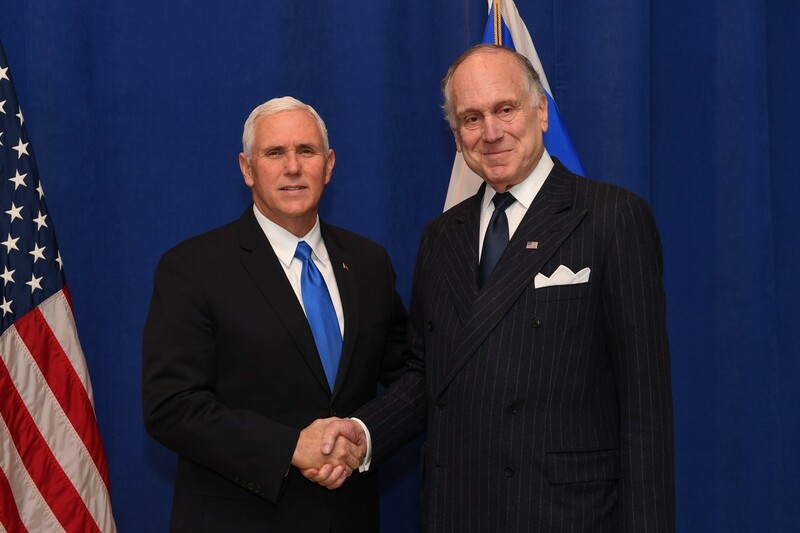 I believe that at this moment in time, and against all odds, a two-state solution is actually quite possible,” Lauder said. United States Vice President Mike Pence, addressed the audience as guest of honor and keynote speaker and said: "The President asked me to be here to remember the day when the United States of America joined 32 other nations to support the creation of the State of Israel, and to express our appreciation for all who support the Jewish people and the Jewish state to this day… But most of all, the President sent me here with a simple message – the same message he delivered earlier this year from the sacred city of Jerusalem… under our administration, America 'will always stand with Israel.'" "Under President Donald Trump, if the world knows nothing else, the world will know this: America stands with Israel – and so will it always be," Pence said. "America stands with Israel because her cause is our cause, her values are our values, and her fight is our fight. "We stand with Israel because we believe in right over wrong, good over evil, and freedom over tyranny." Noting the anti-Semitism and Israel hatred in the UN, Pence said: "With the leadership of our President, and the efforts of our Ambassador to the United Nations, Nikki Haley, one thing is clear… the days of Israel-bashing at the United Nations are over." Regarding efforts to resume the peace process, Pence said: "President Trump is also committed to finally bring peace to the Israeli-Palestinian conflict. And while compromise will be necessary, you can rest assured – President Trump will never compromise the safety and security of the Jewish state of Israel." Israeli Ambassador to the UN Danny Danon said: “Seventy years ago, in this very room, in these very seats where you are sitting today, the dream of the Jewish people of 2,000 years came true… In 1897 Theodor Herzl dreamed of the impossible, in 1947 the Jewish people realized the impossible and today 2017, seventy years later, the modern State of Israel has made the impossible, possible. From this day onward, for the next seventy years and beyond, Israel will continue to be a beacon of democracy, a powerhouse of innovation and a light unto the nations." The 70th anniversary celebration was held in in the presence of more than 600 government officials, diplomats, ambassadors, and students, and organized in partnership with Keren Hayesod and members of the the pro-Israel community including the Conference of Presidents of Major American Jewish Organizations, the JCRC, American Zionist Movement, Bnai Brith International, America Israel Friendship League, the Simon Wiesenthal Center, StandWithUs, IAC, CAMERA, the European Coalition for Israel, The Israel Project, ZOA, World Zionist Organization and the Bnai Zion Foundation.